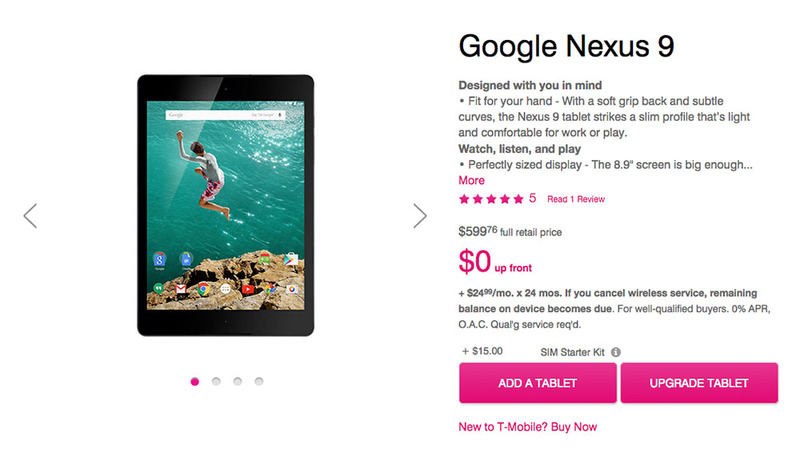 The carrier-ready version of this year’s Nexus tablet, the Nexus 9 LTE, is now available at T-Mobile. Priced at $599.76 if you buy it outright ($24.99 for 24 months with a payment plan), you are getting everything in the WiFi model that we reviewed a few weeks back, only now you have the opportunity to attach it to a carrier to gobble up data when on the go. As a recap, the Nexus 9 runs Android 5.0 “Lollipop” and sports an NVIDIA Tegra K1 64-bit processor, 2GB RAM, 8.9-inch 4:3 display (2048×1536), 8MP rear camera, and a 6,700mAh battery. It’s made of soft touch plastic that will remind you of the Nexus 5, but then classes it up with a metal banding around the outside of its body. Again, the difference between the WiFi and LTE model is that LTE chip for data connectivity. So what networks does it work on? Well, a few, though it’s not as network-friendly as the Nexus 6 or last year’s Nexus 7. Both Google Play and a press site dedicated to this year’s Nexus line-up failed to mention supported networks, but HTC was kind enough to put them up for public consumption on their site. It looks like you should have no problem connecting to HSPA networks of AT&T or T-Mobile. The device also supports T-Mobile, AT&T, and Verizon’s band 4 LTE. Unfortunately, AT&T’s main LTE band of 17 and Verizon’s main band of 13 are not supported. That’s too bad really, because your choices of connectivity with the Nexus 9 are now extremely limited. Interested? To hear our final thoughts, be sure to read our Nexus 9 review. Update: You can buy the Nexus 9 LTE from Google Play now too.